After taking control of Deir ez-Zor, the last major stronghold of Daesh terrorists in Syria, the government troops have found weaponry, and provisions in the city the network of tunnels that were used by terrorists. A Sputnik correspondent reported from the eastern Syrian city that the Syrian forces inspecting the city have found a vehicle laden with explosives containing chemical agents. The car was discovered in the city’s district where two large arms depots were also found. One of the explosives was marked with an inscription that it contained chemical elements, which can only be used in laboratories. Deir ez-Zor was completely liberated by the Syrian armed forces on Friday, according to the Syrian Armed Forces’ General Staff. 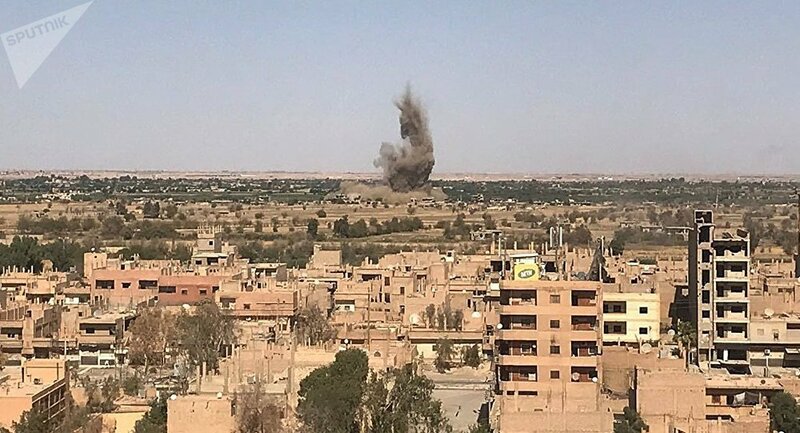 Fights with terrorists, however, continue in the Deir ez-Zor province. Daesh has been reported to have used the chemical weapons in Syria and Iraq. The US-led coalition has revealed it had uncovered in "mortars or RPGs, rocket-propelled grenades, with some type of chemical" that could be used as chemical weapons. The use of chemical weapons is a highly contentious issue in Syria. Since 2013, the chemical attack in Syria's Ghouta was used as a pretext for the foreign invasion led by the US. In April 2017, another chemical attack occurred in the town of Khan Shaykhun in the Idlib province, resulting in 80 deaths. The attack was blamed by the Western powers on Damascus, who denied the allegations. The United Nations has also released a report accusing the Syrian government of using chemical weapons, saying it "continued to deliberately target civilians, including through the use of chemical weapons against civilians."